We all know how cool Spark is when it comes to fast, general-purpose cluster computing. Apart from the core APIs Spark also provides a rich set of higher-level Apis which include Spark SQL for SQL and structured data processing, MLlib for machine learning, GraphX for graph processing, and Spark Streaming for high-throughput, fault-tolerant stream processing of live data streams. Through this post we'll explore the Spark SQL API and see how to use it with Avro data. As stated earlier, Spark SQL is a Spark module for structured data processing. It provides a programming abstraction called DataFrames and can also act as distributed SQL query engine. A DataFrame is a distributed collection of data organised into named columns. We can think of a DataFrame as a table in a relational database or as a dataframe in R or Python. Apache Avro is a very popular data serialization system, specially in BigData world. We'll use the spark-avro library for this. spark-avro is a beautiful library provided by Databricks, which helps us in reading and writing Avro data. We begin with creating an instance of JavaSparkContext using SparkConf. Once created, this JavaSparkContext instance is used to create an instance of SQLContext, which will be used to read, operate on and write the Avro data. Next, we use the load() API provided by SQLContext to read some Avro data in from a given source. The load() API returns a DataFrame created out of the data read from a specified source. DataFrames can be constructed from a wide array of sources such as structured data files, tables in Hive, external databases, or existing RDDs. Another good thing about DataFrame is that the DataFrame API is available in Scala, Java, Python, and R.
HBase shell is great, specially while getting yourself familiar with HBase. It provides lots of useful shell commands using which you can perform trivial tasks like creating tables, putting some test data into it, scanning the whole table, fetching data from a specific row etc etc. Executing help on HBase shell will give you the list of all the HBase shell commands. If you need help on a specific command, type help "command". For example, help "get" will give you a detailed explanation of the get command. But this post is not about the above said stuff. We will try to do something fun here. Something which is available, but less known. So, get ready, start your HBase daemons, open HBase shell and get your hands dirty. For those of us who are unaware, HBase shell is based on JRuby, the Java Virtual Machine-based implementation of Ruby. More specifically, it uses the Interactive Ruby Shell (IRB), which is used to enter Ruby commands and get an immediate response. 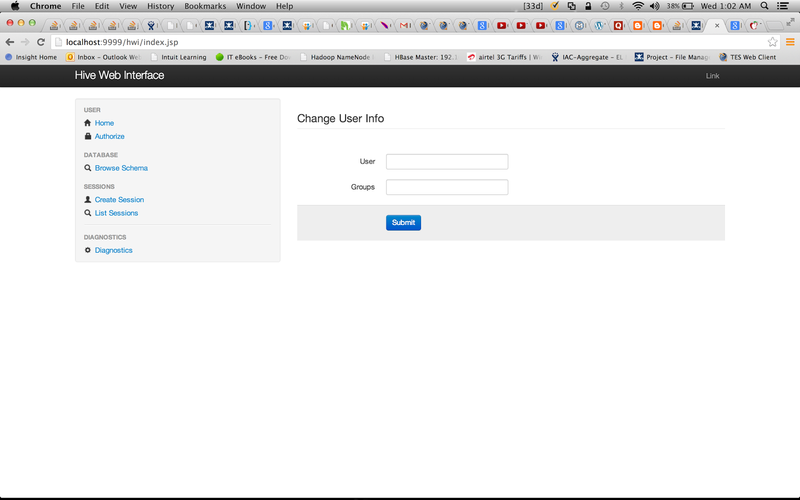 HBase ships with Ruby scripts that extend the IRB with specific commands, related to the Java-based APIs. It inherits the built-in support for command history and completion, as well as all Ruby commands. We will start with something that is my favorite, which is having shell commands that provide jruby-style object-oriented references for tables. What does that mean?? Previously all of the HBase shell commands that act upon a table have a procedural style that always took the name of the table as an argument. But now it is possible to assign a table to a jruby variable. So no more unnecessary typing of table names. The table reference can then be used to perform data read write operations such as puts, scans, and gets along with admin functionality such as disabling, dropping, describing tables. Moving further, have you ever felt how cool it would be to have the ability to clear HBase shell? Quite often you would find HBase shell completely filled with results of previously executed queries. But we don't have a clear command like our OS to clear the shell and make it cleaner so that we can concentrate on the result of next query properly. To overcome this problem we can again take advantage of the fact that HBase shell is based on JRuby. All we have to do is create a .irbrc file with the desired customization logic. To do this we just have to create a file named .irbrc in our home directory and add the desired customization code in it. Save the file and exit. To ross check, open HBase shell and start pressing the up arrow key. You should be able to see the commands executed in previous sessions. This will list down all the directories and files present inside the directory called directory_name. NOTE : Please mind the quotes(' ') in the above shown command. This comes in pretty handy when you want to perform some quick checks on your data. That was it for today. I will try to cover few more things some other day. As always, your comments and suggestions are welcome. Do let me know if there is any scope to make the post better in any manner. Here is a list of my top 10 most voted answers on Stackoverflow. All these questions are related to cloud computing including discussions on distributed storage and computing tools like Hadoop, HBase etc. I hope you find it useful as others did. How can I develop an ASP.NET web application using Hadoop as Database? How (in Hadoop),is the data put into map and reduce functions in correct types? Why do we need Hadoop passwordless ssh? Let me start by thanking Mortar for developing such an amazing tool. Isn't it really cool to have the ability to make your Pig development faster without having to write a complete script, run it and then wait for for local or remote Pig to finish the execution and finally give you the final data? Quite often, when writing a Pig script, I find it very time consuming to debug what each line of my script is doing. Moreover, the fact that Pig is a dataflow language makes it even more important to have a clear idea of what exactly your data looks like at each step of the flow. This obviously helps in writing compact and efficient scripts. Trust me, you don't want to write inefficient code while dealing with Petabytes of data. It's a bitter truth that Hadoop development iterations are slow. Traditional programmers have always had the benefit of re-compiling their app, running it, and seeing the results within seconds. They have near instant validation that what they’re building is actually working. When you’re working with Hadoop, dealing with Petabytes of data, your development iteration time is more like hours(even days sometimes). With watchtower folks at Mortar have made an awesome effort to bring back that almost instant iteration cycle developers are used to. Not only that, Watchtower also helps surface the semantics of your Pig scripts, to give you insight into how your scripts are working, not just that they are working. Watchtower is basically a daemon which continuously watches your data and script running over it in real time. It stores the state of your data at each step and shows how it changes at each step as your script goes. It actually shows the exact flow of your data, directly inline with your script. Not only this Watchtower helps us in finding out the errors in our script as we proceed. So, you don't have to wait until the completion and execution of your script. Since Watchtower is constantly sending data through your entire script, errors are surfaced and displayed instantly. Instant Sampling of Your Data: Watchtower samples your data in the background while writing your script. This means that when you start writing code, Watchtower is able to provide instant and accurate examples of your data flowing through your script. Complete File Watching: Watchtower watches all files in your Mortar Project for changes. If watchtower detects a change in any of your scripts, UDFs, or even your data, it will recalculate the samples instantly and show you what changed. Instant Schema Evaluation: Watchtower re-evaluates your schema on file save, not only verifying that you referred to the implied schema correctly, but also to show how Pig builds up the schema and generates field names. This is incredibly powerful for the novice (or experienced!) Pig developer who doesn't full understand how Pig uses features like the disambiguate operator. Instant Error Catching: Since Watchtower is running data through your entire script, errors in your script and UDFs are surfaced immediately. Allowing you to debug and fix the errors before you ship your job to an Hadoop cluster. To get started with Watchtower visit its installation page. It contains all the info you need to get started with Watchtower and use it. This page contains a detailed description of how Watchtower works, along with a short introductory video. 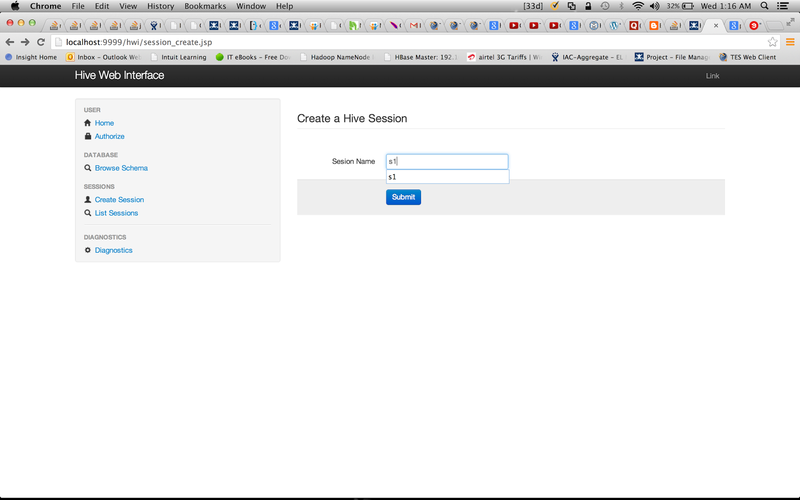 How to run Hive queries through Hive Web Interface. One of the good things about Hadoop, and related projects, which I really like is the WebUI provided to us. It makes our life a lot easier. Just point your web browser to the appropriate URL and quickly perform the desired action. Be it browsing through HDFS files or glancing over HBase tables. Otherwise you need to go the shell and issue the associated commands one by one for each action [I know i'm a bit lazy ;)]. Hive is no exception and provides us a WebUI, called as Hive Web Interface, or HWI in short. But, somehow I feel it is less documented and talked about as compared to HDFS and HBase WebUI. But that doesn't make it any less useful. In fact I personally find it quite helpful. With its help you can do various operations like browsing your DB schema, see your sessions, query your tables etc. You can also see the System and User variables like Java Runtime, your OS architecture, your PATH etc etc. hive.hwi.listen.host : The host address the Hive Web Interface will listen on. hive.hwi.listen.port : The port the Hive Web Interface will listen on. hive.hwi.war.file : This is the WAR file with the jsp content for Hive Web Interface. Values for these properties is totally your choice. I'll go ahead with the defaults. You would probably want to setup HiveDerbyServerMode as well if you wish to allow multiple sessions at the same time. Note : Make these changes in hive-site.xml file inside your $HIVE_HOME/conf/ directory. Create it if you don't have it already. Please don't change anything in default-site.xml file. This is important. Click on Create Session under SESSIONS section, enter some session name and hit Submit. This will take you to the Manage Session screen. This is the place where all the action will take place. Come down to the Session Details section and enter a file name, say /Users/tariq/res.txt, in the Result File box. This is the file where the result of your query will get stored. If you expect your result to be very huge you can just enter /dev/null over there. Remember the result file is local to the web server. Similarly enter the error file if you wish. Now come down to the Query box and write the query you want to execute. Choose Yes or No for Silent Mode as per your wish. Select Yes for Start Query and hit Submit. You should be able to see the file /Users/tariq/res.txt by now containing the result of your query. You can also view the result by clicking on View File option which will appear next to the Result File box upon the successful completion of your query. That is it. Hope it helps. Do let me know in case of any issue. Quite often while working with Pig you would have reached a situation wherein you found that your Pig scripts have reached such a level of complexity that the flow of execution, and it’s relation to the MapReduce jobs being executed, has become difficult to visualize. And this eventually ends up with the need of additional efforts required to develop, maintain, debug, and monitor the execution of scripts. But not anymore. Thankfully Netflix has developed a tool that enables developers to visualize and monitor the execution of their data flows at a logical level, and they call it Lipstick. As an plementation of PigProgressNotificationListener, Lipstick piggybacks on top of all Pig scripts executed in our environment notifying a Lipstick server of job executions and periodically reporting progress as the script executes. Clicking on the header (User, Job, Start Time, etc.) for a column will sort by the column (asc/desc). Search by username or job name. Pagination controls (next page, show X jobs per page, etc). Along with this there is a whole bunch of other cool stuff that Lipstick offers. You can find more on Lipstick user guide. For a detailed overview you can visit their official blog section. And if you can't wait anymore and want to give it a try straight away, you can directly go to their repository. How to install MapR M3 on Ubuntu through Ubuntu Partner Archive. First things first. 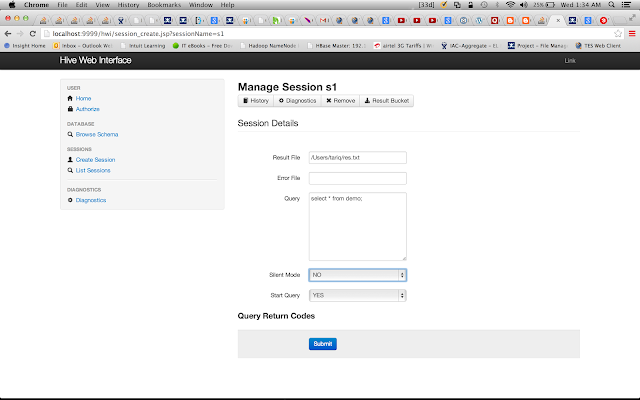 Open your sources.list file and add the MapR repositories into it. Note : If it throws any error regarding MapR repositories, just uncomment the lines which allow us to add software from Canonical's partner repository. 1, 2, 3..and you are done. Isn't that cool?Just three easy steps and you have your brand new single node hadoop cluster in your lap. But, there are some pre-requisites and it's very important to satisfy them. In order to install other hadoop projects and for further documentation you can visit the official documentation here. I hope you found this post helpful, and as always comments and suggestions are welcome. 8 years ago not even Doug Cutting would have thought that the tool which he's naming after the name of his kid's soft toy would so soon become a rage and change the way people and organizations look at their data. Today Hadoop and BigData have almost become synonyms to each other. But Hadoop is not just Hadoop now. Over the time it has evolved into one big herd of various tools, each meant to serve a different purpose. But glued together they give you a powerpacked combo. 1- Hadoop : Hadoop is basically 2 things, a distributed file system(HDFS) which constitutes Hadoop's storage layer and a distributed computation framework(MapReduce) which constitutes the processing layer. You should go for Hadoop if your data is very huge and you have offline, batch processing kinda needs. Hadoop is not suitable for real time stuff. You setup a Hadoop cluster on a group of commodity machines connected together over a network(called as a cluster). You then store huge amounts of data into the HDFS and process this data by writing MapReduce programs(or jobs). Being distributed, HDFS is spread across all the machines in a cluster and MapReduce processes this scattered data locally by going to each machine, so that you don't have to relocate this gigantic amount of data. 2- Hbase : Hbase is a distributed, scalable, big data store, modelled after Google's BigTable. It stores data as key/value pairs. It's basically a database, a NoSQL database and like any other database it's biggest advantage is that it provides you random read/write capabilities. As I have mentioned earlier, Hadoop is not very good for your real time needs, so you can use Hbase to serve that purpose. If you have some data which you want to access real time, you could store it in Hbase. Hbase has got it's own set of very good API which could be used to push/pull the data. Not only this, Hbase can be seamlessly integrated with MapReduce so that you can do bulk operation, like indexing, analytics etc etc. 3- Hive : Originally developed by Facebook, Hive is basically a data warehouse. It sits on top of your Hadoop cluster and provides you an SQL like interface to the data stored in your Hadoop cluster. You can then write SQLish queries using Hive's query language, called as HiveQL and perform operations like store, select, join, and much more. It makes processing a lot easier as you don't have to do lengthy, tedious coding. Write simple Hive queries and get the results. Isn't that cool? ?RDBMS folks will definitely love it. Simply map HDFS files to Hive tables and start querying the data. Not only this, you could map Hbase tables as well, and operate on that data. Tip : Use Hive when you have warehousing needs and you are good at SQL and don't want to write MapReduce jobs. One important point though, Hive queries get converted into a corresponding MapReduce job under the hood which runs on your cluster and gives you the result. Hive does the trick for you. But each and every problem cannot be solved using HiveQL. Sometimes, if you need really fine grained and complex processing you might have to take MapReduce's shelter. 4- Pig : Pig is a dataflow language that allows you to process enormous amounts of data very easily and quickly by repeatedly transforming it in steps. It basically has 2 parts, the Pig Interpreter and the language, PigLatin. Pig was originally developed at Yahoo and they use it extensively. Like Hive, PigLatin queries also get converted into a MapReduce job and give you the result. You can use Pig for data stored both in HDFS and Hbase very conveniently. Just like Hive, Pig is also really efficient at what it is meant to do. It saves a lot of your effort and time by allowing you to not write MapReduce programs and do the operation through straightforward Pig queries. Tip : Use Pig when you want to do a lot of transformations on your data and don't want to take the pain of writing MapReduce jobs. The list is actually pretty big, but I have covered only the most significant tools. Over time if I feel like something else should be mentioned here I would definitely do that. Comments and suggestions are welcome. Hadoop+Ubuntu : The Big Fat Wedding. Now, here is a treat for all you Hadoop and Ubuntu lovers. Last month, Canonical, the organization behind the Ubuntu operating system, partnered with MapR, one of the Hadoop heavyweights, in an effort to make Hadoop available as an integrated part of Ubuntu through its repositories. The partnership announced that MapR's M3 Edition for Apache Hadoop will be packaged and made available for download as an integrated part of the Ubuntu operating system. Canonical and MapR are also working to develop a Juju Charm that can be used by OpenStack and other customers to easily deploy MapR into their environments. The free MapR M3 Edition includes HBase, Pig, Hive, Mahout, Cascading, Sqoop, Flume and other Hadoop-related components for unlimited production use. MapR M3 will be bundled with Ubuntu 12.04 LTS and 12.10 via the Ubuntu Partner Archive. MapR also announced that the source code for the component packages of the MapR Distribution for Apache Hadoop is now publicly available on GitHub. MapR is the only distribution that enables Linux applications and commands to access data directly in the cluster via the NFS interface that is available with all MapR Editions. The MapR M5 and M7 Editions for Apache Hadoop, which provide enterprise-grade features for HBase and Hadoop such as mirroring, snapshots, NFS HA and data placement control, will also be certified for Ubuntu. Now, as you get Hadoop integrated natively with Ubuntu, it's a lot easier to install it and go. No more unnecessary downloads and wacky configuration steps. And the best part is the NFS interface available with MapR's distribution that enables other Linux commands and application to access the cluster data directly. The Ubuntu/MapR package will be available through the Ubuntu Partner Archive for 12.04 LTS and 12.10 releases of Ubuntu on the official website starting from April 25, 2013. For more info you can get the Ubuntu and Hadoop: the perfect match white paper from here. Is your data really Big(Data)?? The advent of so many noticeable tools and technologies for handling BigData problems has made the lives of a lot of people and organizations easier. A lot of these are open source, they have good support, good community and are pretty active. But there is another aspect of it. When things become easy, free, with good support and in abundance, we often start to over-utilize them. Having said that, I would like to share one incident. 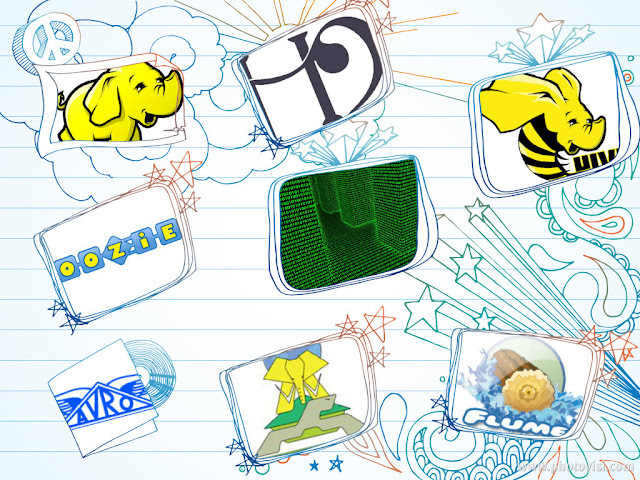 We organize Hadoop meetups here in Bangalore(India). In one of the initial meetings we just decided to exchange views with each other on how we are using Hadoop, and other related projects. There I noticed that a lot of folks were either using or planning to use Hadoop for problems which could easily be solved using traditional systems. In fact they could be solved in a much better and efficient way. There was absolutely no need to use Hadoop for these kind of problems. So, it raised question in my mind. The question was, are we really getting the 'point'. To me it seems like those folks were trying to stitch a piece of cloth using a sword. From my experience, I have learned one thing. Even if we have the strongest of weapons we can't win a battle if we are not using it at the right spot at the right time. Same holds good for the industry. Normally we tend to use a particular 'thing' for all our needs, if we find that it had worked for us in the past. There is no harm in it. This is human tendency to try to make things swift. But this doesn't work always. Same is the case when it comes to BigData. First of all, BigData is not an absolute term. It is rather relative. Relative to the resources that we have. For example 1PB might be big enough for me, but for an internet giant, say Google, it is still not that big. So how to decide whether the data which I am going to handle qualifies to be called BigData or not. The thumb rule is that once you cross the threshold after which you are not able to handle the data, which you have, with the help of resources and system you already have, you can assume that your data has grown into BigData. But, in the process we should always keep one thing in mind. Are we really able to exploit the resources we already have. Not to offend anyone, but I have seen it a couple of times that folks are not using their systems to the fullest and turning towards rather new, and meant for completely different systems, to solve their issues. For instance if somebody wants to run real time ad-hoc queries over his or her 1TB data set, he or she could do it pretty efficiently using MySQL. Planning to use Hadoop or Hbase in such a situation makes no sense. Moreover it would be wastage of systems and resource, atleast in my view. Long story short, 'think well before you act'. Analyze your data and the requirements properly and then conclude whether you are really gonna face BigData issues. Because, 'with BigData, comes big responsibilities'. Although I am a bit late, it is still worth wishing the most significant 'Computer Science Thing' I have know since I got my computer science senses. You might find me biased towards Hadoop, but I am actually helpless, when it comes to Hadoop. I started my career as a Hadoop developer so i'll always have that 'first love' kinda feeling for Hadoop. Back in 2004, not even Dough Cutting would have thought that Hadoop will so quickly grow into one of the most powerful computing platforms, when he had started to work on a platform for distributed storage and processing, after getting inspired by those 2 great papers from Google on GFS(Google File System) and MapReduce, which he later on named 'Hadoop' after his kid's toy elephant. And here we are today. It was mid 2006 when I had heard about Hadoop for the first time at an Open Source Conference, held here in Bangalore(India). But I never knew at that time this is that piece of technology that is going to fire a revolution in the field of computing. After that I almost forgot about all of this. But destiny had tied Hadoop with me by then. On one fine evening of early 2007, I went to see my sister who was working on something related to distributed computing at that time. I had actually gone there to get some guidance for my final year engineering project. That was the incident that changed everything. Asking about something for myself I ended up with some insights on Hadoop. Since then I am just in love with it and still trying to learn everything about it. I am sorry if you were expecting this post to be a technical one, like other posts of mine. This one is just about Hadoop in a totally non technical way. I remember that thread from Doug Cutting which says "Release 0.1.0 of Hadoop is now available". It was April 2nd, 2006. Who would have imagined that this 0.1.0 would so quickly turn into 2.0.0. Many thanks to the great community, all the contributors, committer, QAs QCs and everybody else who has helped Hadoop in growing so fast and thus helping people like me.